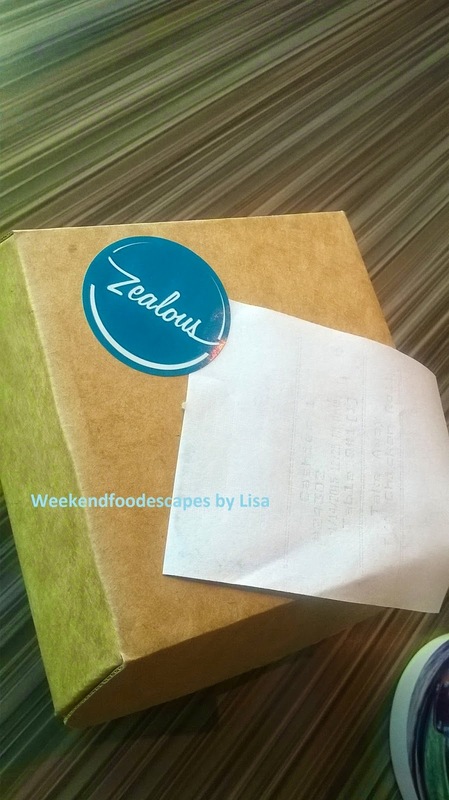 Zealous has a new menu and now has two cafes, both on little walker st. The new second cafe in 90 Arthur St / little walker st is at the bottom of a commercial building. It's decked out with much more seating than the tiny original cafe. 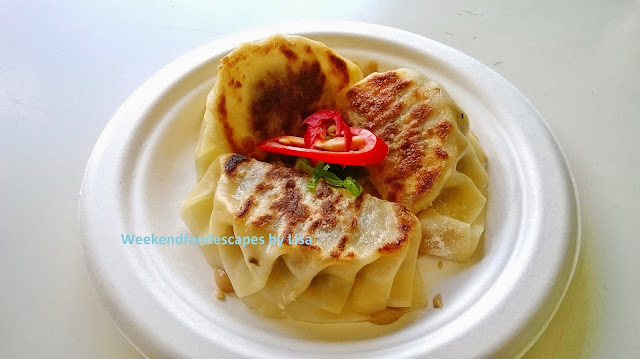 I used to be a regular at Zealous as the staff are friendly, the food was delicious and it was of high value competing with all the North Sydney Eateries. The staff are still very friendly but Zealous no longer competes as well with the rest of North Sydney. There are plenty of North Sydney cafes where lunch on average is $15-20 for a sit down lunch. In terms of take away options, you're looking at $12ish. 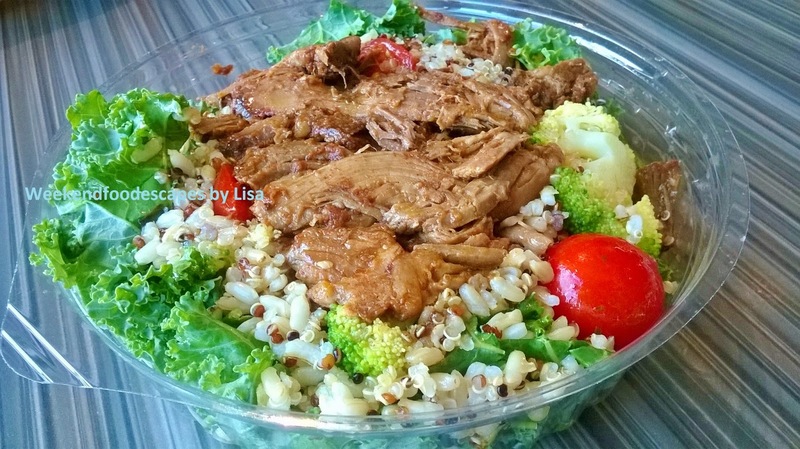 I ordered the lamb salad with quinoa, kale, tomato and broccoli (above, $12). It was a very healthy salad and filling but tasted very dry. 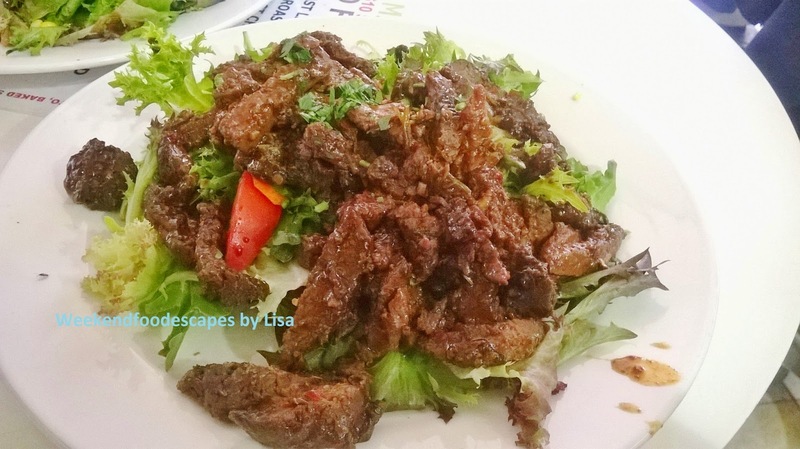 There are many other salad alternatives in North Sydney that are tasty and cheaper. I miss the old salads that Zealous used to offer for $6. I previously would agree and advocate with the 100% like rate but I would probably downgrade this to a 75% now. I've also tried the chicken roll (below, $12) which had spicy chicken bits, corn and salsa relish. The chicken was dry and the bun looked slightly burnt. I will definitely come back for convenience. 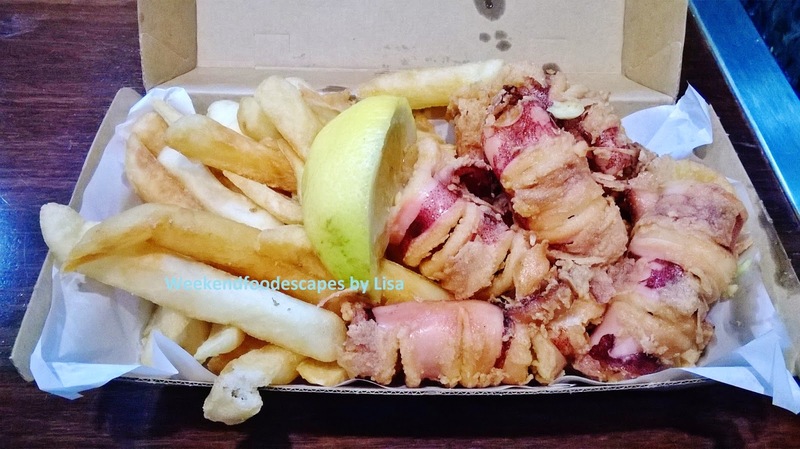 However there's a lot of great places to eat in North Sydney! Bowery Lane – Roasted snapper, slow cooked lamb shoulder, Charlie Chaplins, Brooklyn beer, wines. 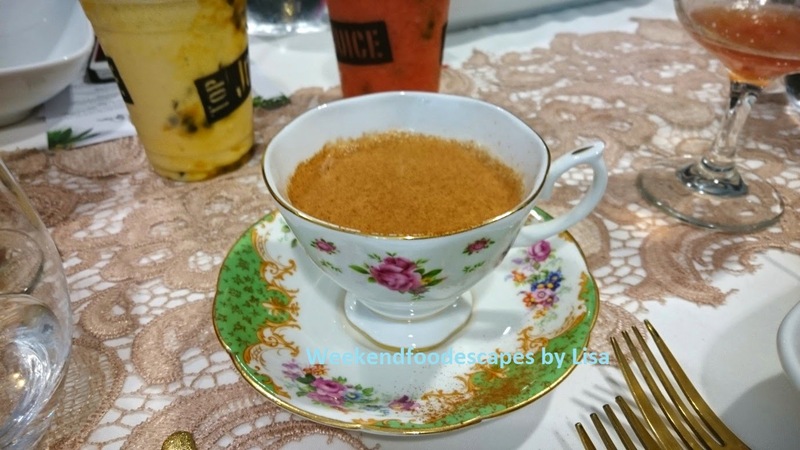 CBD noodles – Chicken laksa and wonton noodle soup. Crema from the Garden – Tea, coffee, and cakes. Los Vida – Fish tacos, chilaquiles, quesadillas. Sushi Hub – Bite-sized sushi plate. 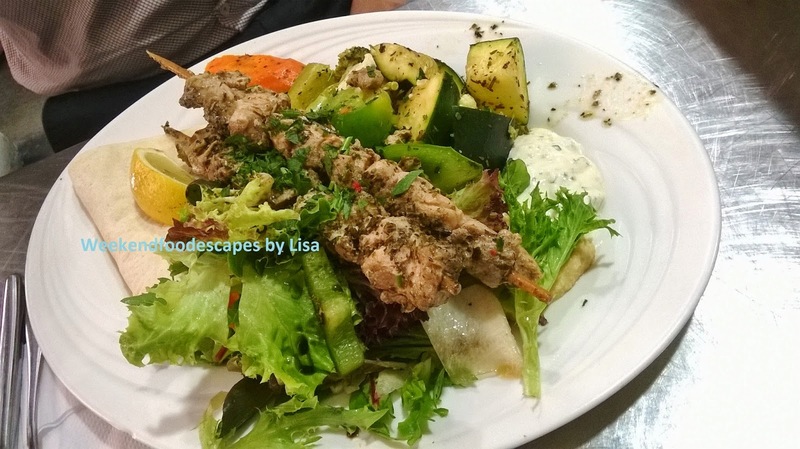 Soul Origin – Baguettes, paninis, salads, freshly made chai. 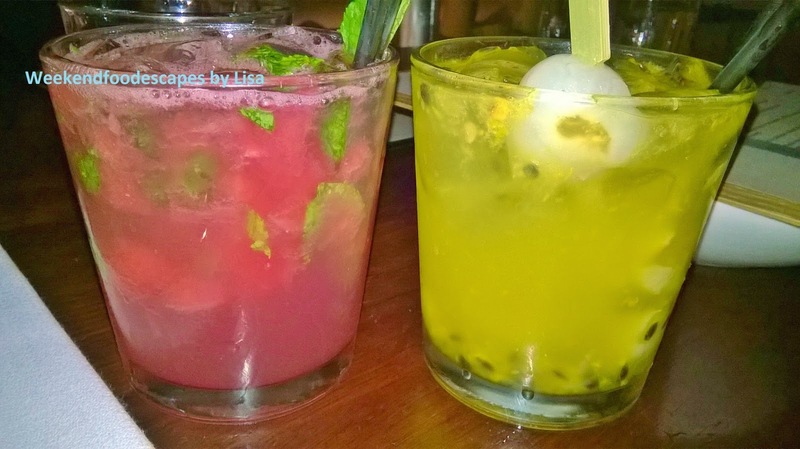 Top Juice – Juices and fresh smoothies. WinterGarden Deli – Pumpkin and feta frittata with kale and quinoa salad, Nutella frappé. 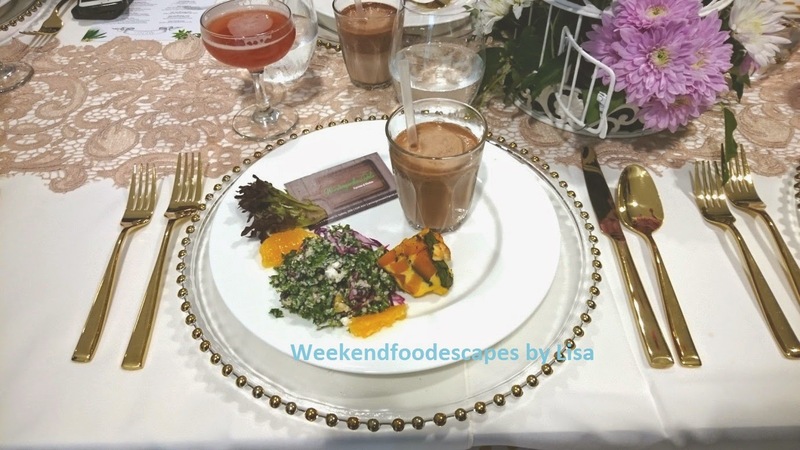 To start us off the Wintergarden Deli introduced the group to their Nutella frappe and savoury pumpkin and feta frittata with kale and quinoa salad. Nutella frappé, you ask? The drink was absolutely delicious! As for the frittata, the slight sweetness of the pumpkin and salty creaminess of the feta was a nice combination. The salad being sweet from raisins, sour from the dressing, and crunchy complemented the frittata well in taste and texture. Next up was Sushi Hub with a genuine degustation sized plate. The plate that came out was superb in its simplicity. A spicy tuna with brown rice roll and chicken and avocado roll were both great as bite-sized pieces. The salmon sashimi rose was perfect – slightly chilled, soft, and juicy. Two salads – seaweed and jellyfish, just the right amount of sweet and salty flavours to sate your tastebuds and just that bit of crunch to complete the sushi experience. 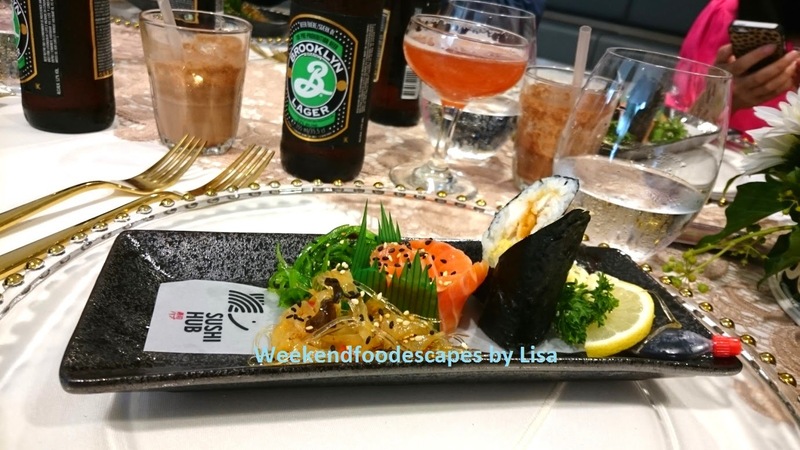 The sushi plate was paired with a light and crisp Brooklyn Lager. It was also quite hoppy, I did think it contrasted well with the relatively smooth flavours of the sushi. 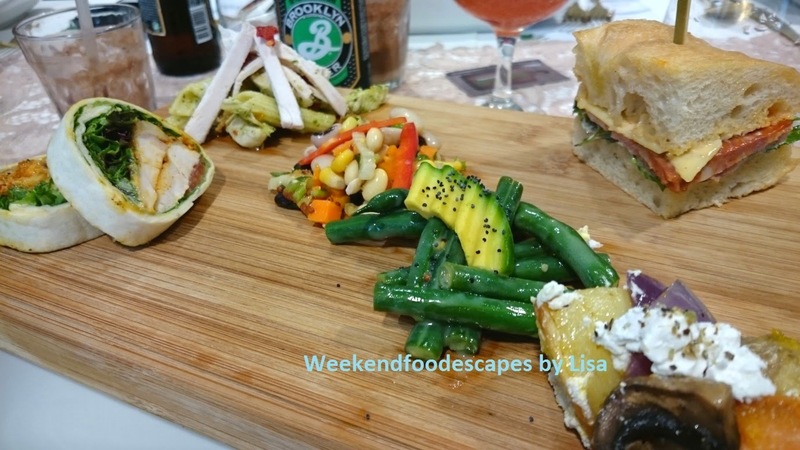 Following up the sushi was a tasting board made up of baguettes, paninis, and wraps adorned with various sides – not all boards were clones of each other. This platter was made with breads from some of Sydney’s best artisan bread-makers and the sides were expertly prepared. Made with a sourdough that is soft and chewy yet still firm enough to hold shape despite being manhandled by yours truly it adds just a hint of sour to the smoothness of the cheese, the saltiness of the salami, and the mixed leaf salad. Time for Mexican and it started well with a fish taco. A deep fried fish fillet on a shallow bed of vinegared cabbage topped with chipotle mayo and jalapenos three ways – fresh, pickled, and grilled. 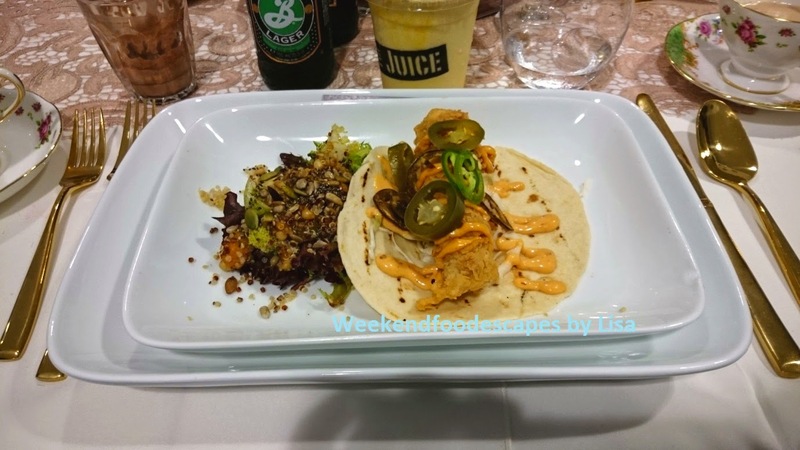 I enjoyed this dish a lot as the flavours were very fresh and the fried fish and fried side salad added crunch to the usual soft taco texture. Chilaquiles and quesadillas were shared amongst the group. The chilli had a bit of heat tempered by the beans and cheese while the quesadillas were quite salty with more meat (pulled pork) than cheese - a bit more guacamole and chipotle sour cream would have helped. Both were mouth-wateringly good and definitely a pairing I want to have the next time I’m watching sport with my mates. At this stage everyone was well and truly stuffed so when the whole roasted snapper and slow cooked lamb shoulder it was with heavy hearts that we could not partake more than we did. From the little I did have I can say for certain that the chef did an amazing job. 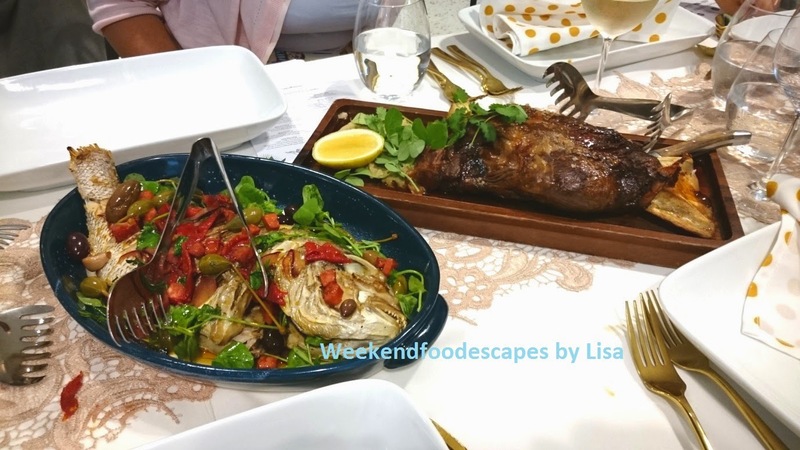 The fish was perfectly roasted and smothered in fresh Mediterranean flavours and while the lamb shoulder was tasty it was a tad dry. Despite our full stomachs once the chicken sliders reached the table there was magically space for one, or two. 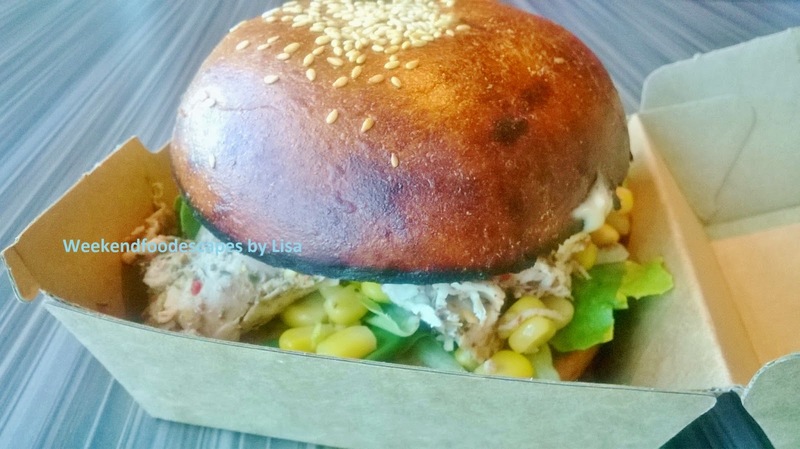 Sweet brioche like buns, chargrilled chicken, creamy mayo, hot sauce, with tart slaw. They were so good one of the bunnies joined us. 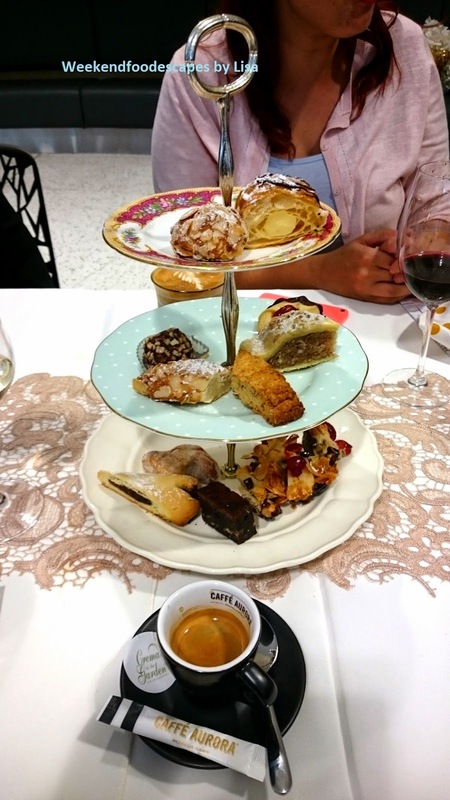 It all ended with a high tea style platter of cakes and an espresso for me. My favourite dishes for the day were the tacos, chilaquiles (bean nachos), and the chicken sliders – probably a reflection of my penchant for casual food you can share with mates. You must try the Nutella frappes AT THE FIRST OPPORTUNITY. I can’t say that there is anything to avoid, though the noodle dishes seemed to be weak in comparison to all the others. 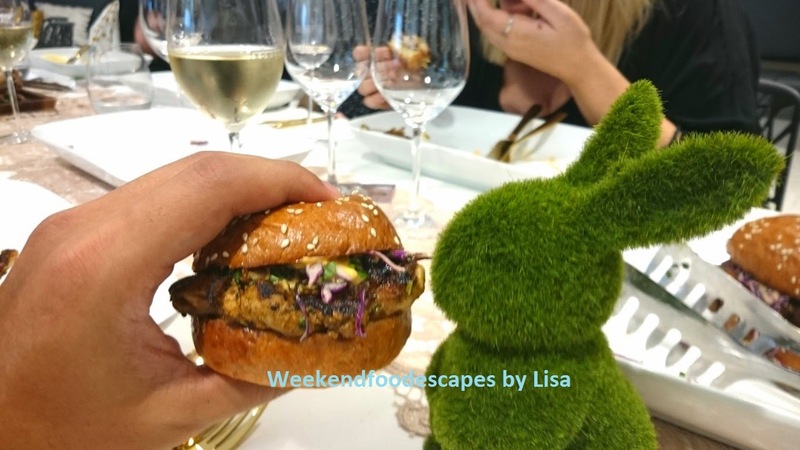 Please Note: Thanks to my guest writer who attended this special invite on behalf of Weekendfoodescapes by Lisa. 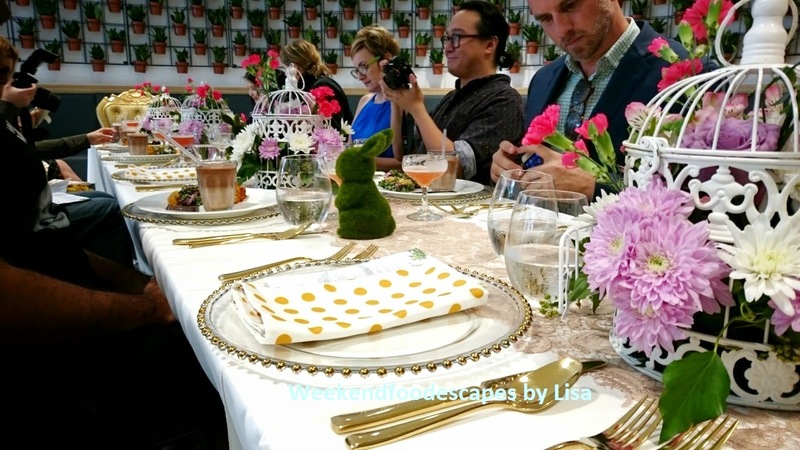 Please note the guest writer was invited to the launch of Winter Garden. 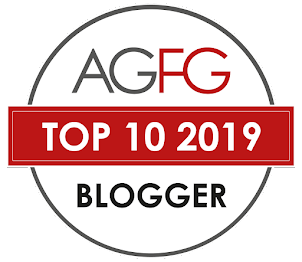 All words, photos, opinions are my own (Of the guest writer). 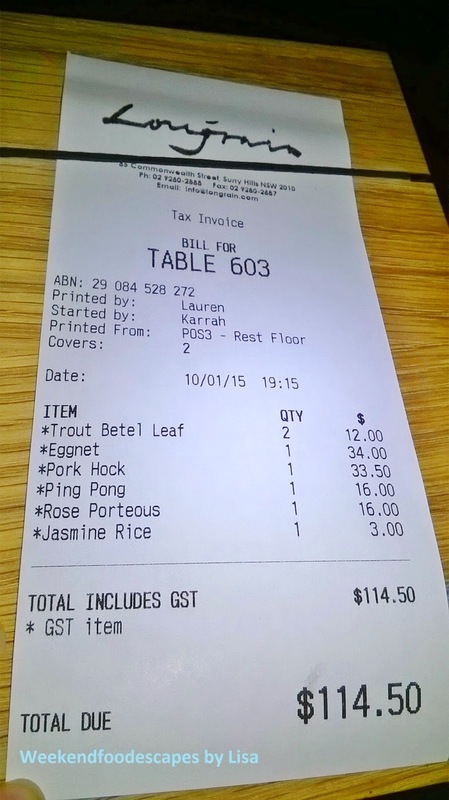 Longrain is a very trendy, up-market fusion Thai restaurant in Surry Hills. 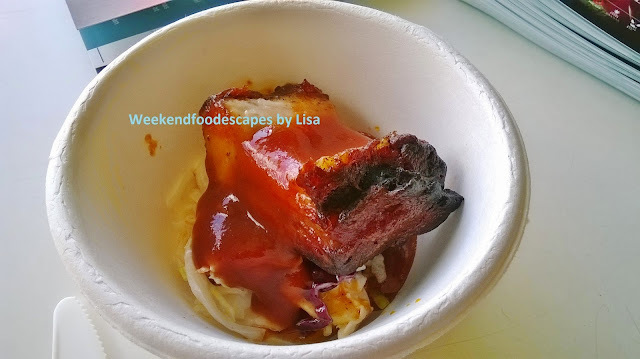 The dishes I tried were definitely a bit of Asian Fusion with elements of Vietnamese flavours and other modern twists. Come early to ensure you get a table (as they don't take bookings). For entree, I tried the trout betel leaf ($6 each). 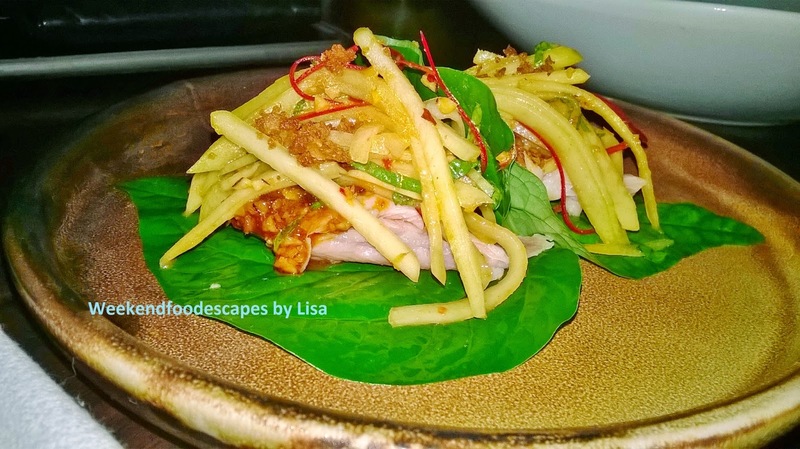 The entree is set on the betel leaf and has smoked river trout, peanut relish and green mango on top. It's a small entree but packed with refreshing flavours. 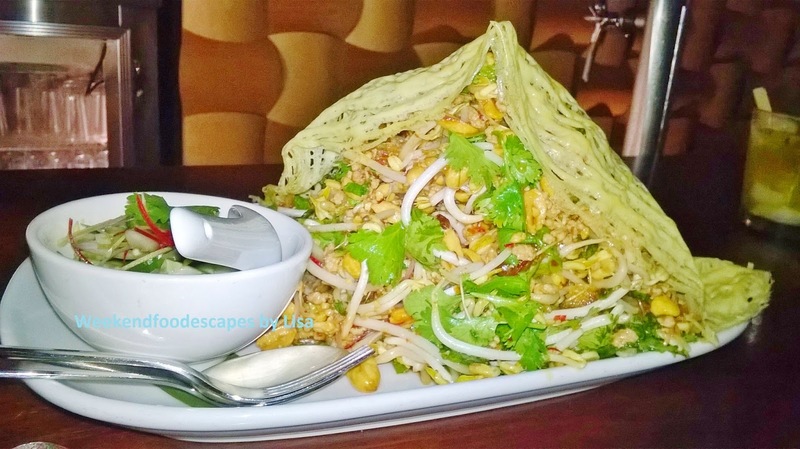 Below is the Egg Net dish ($34) which had a very large pile of bean sprouts, pork, the odd prawn, peanuts and coriander. The flavours were very strong Vietnamese-like fish sauce. There was also a side of cucumber relish in a small bowl to accompany the fish. It was a nice dish, the flavours are not uncommon to many Vietnamese restaurants that I have been to. 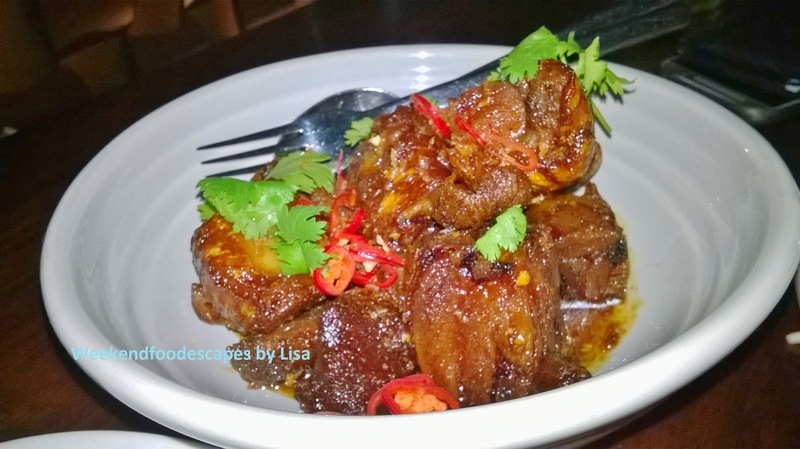 Below is also the caramelised pork hock with five spices, chili vinegar ($33.50). It was so sugary and rich that I felt sick after a few pieces! Perhaps only order this if you can handle it or you may have to order some additional rice. Overall, I had a nice experience. The atmosphere is nice, the customer service was solid but I had higher expectations for the food. It was worthwhile checking out but I'm not sure if I'd come back here regularly. It regularly rates well among a lot of my friends. I think I just prefer good, wholesome and traditional Thai. The fish markets is always hectic, full of tourists and hungry seafood lovers. You must go very early or be a very patient person. After another recent visit, I opted for some salt and pepper calamari with chips (It was about $16). The calamari was heavenly! It was so very fresh but super tasty with crunch bits of salt and pepper. 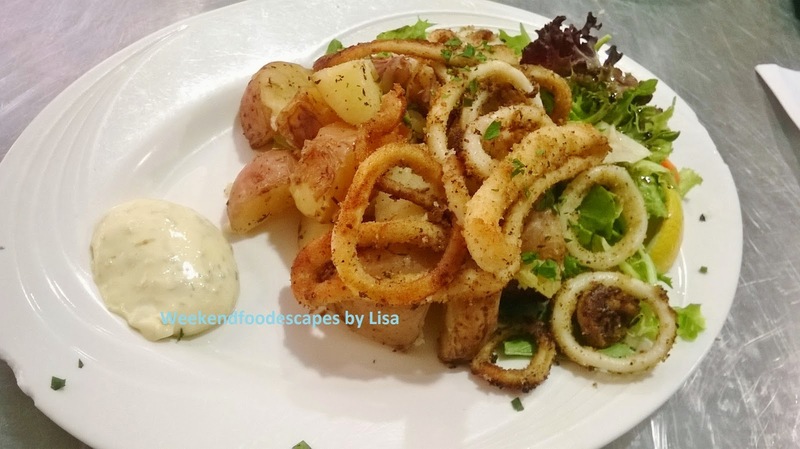 The crunch was sporadic so it did not over power the natural flavours of the calamari. My favourite place for sashimi is at Peter's Fish market. I order my favourites including some tuna, king fish and salmon sashimi. 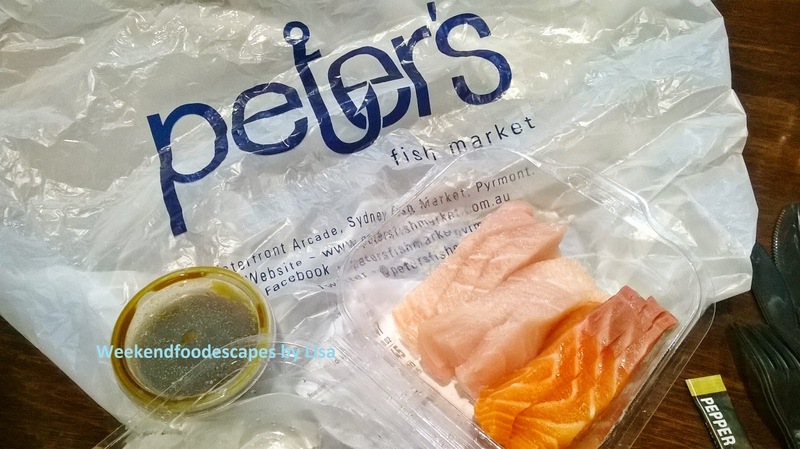 Sashimi can be a bit pricey but when it's from Peter's it taste amazing and so fresh. The small portion of sashimi below cost $10. I love it! I absolutely love the fish markets. 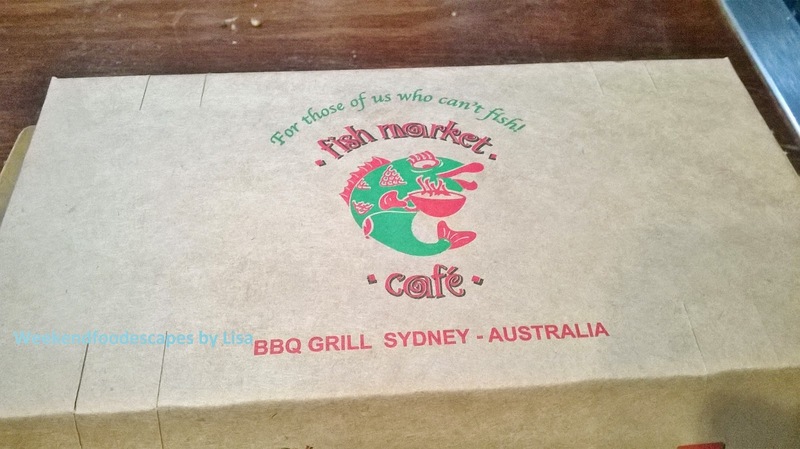 I've been to Fish Market Cafe and Peter's several times. 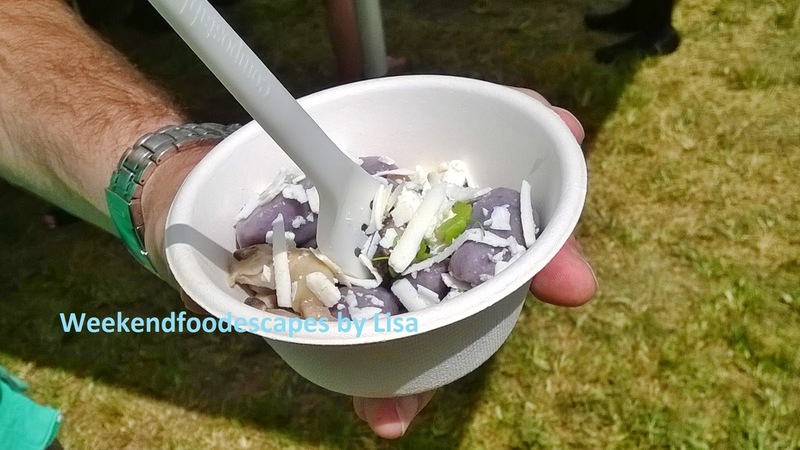 Macadamia Nuts can be a rare treat in the nut world. They are generally quite expensive because they are slow to grow. If you are a Macadamia fan then you will be excited to hear that there is a new chocolate spread @ Woolworths/Coles for you to check out. 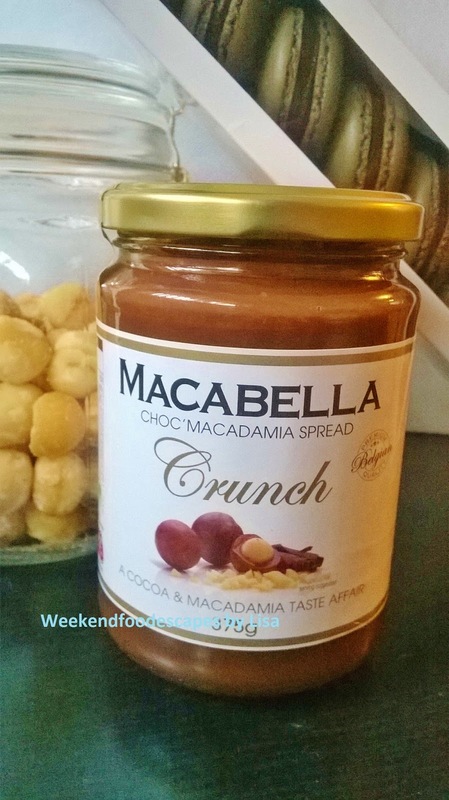 For a premium chocolate spread for breakfast or dessert (I suggest spreading some on crumpets); check out Macabella. I absolutely love Nutella but change is refreshing. Hazelnuts are delicious but it's hard to resist a macadamia nut. 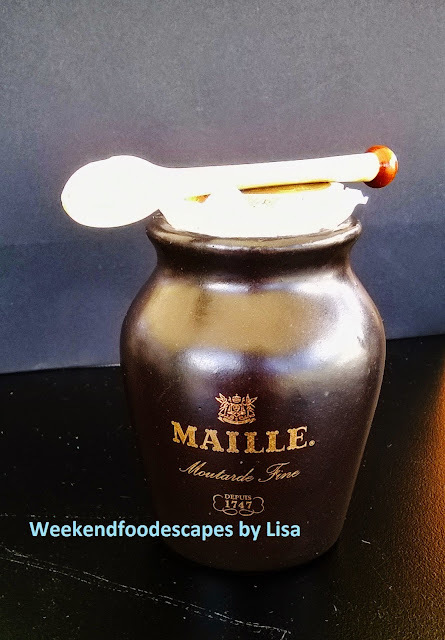 You'll find little chunks of macadamias in Macabella to enjoy, it's a touch of premium compared to Nutella. Please Note: I was given a sample to try this product. All words, opinions and photo are my own. My favourite was the baked pasta (above). I thought it was such a beautifully presented dish and reminded me how delicious baked pasta can be. 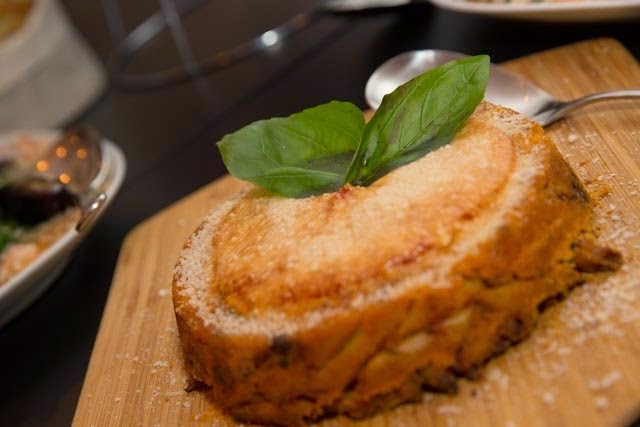 The perfect baked pasta has the perfect balance of pasta, cheese and at La Casa is beautifully presented. This dish will be available in the months to come on their winter menu. Also have you been yearning for pizza? 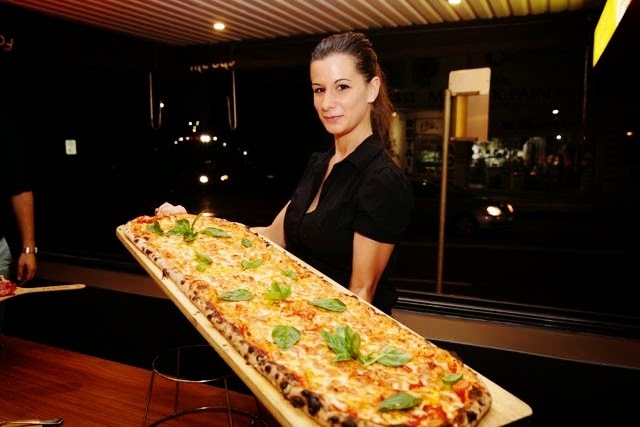 How about a metre long pizza (from $60)? The Pizza base is nice and thin. If you can't eat that much then you can get normal sized pizzas from $19-$25. There are tonnes of other things to try at La Casa so if you are a local, come and check it out. 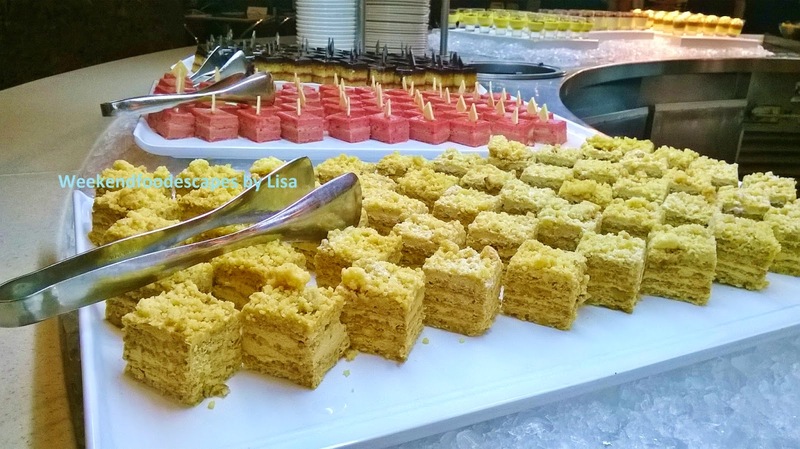 Please note: I was invited to the relaunch of La Casa Ristorante as a guest. All words and opinions are my own. I also got the pleasure of meeting Jackie, blogger of "Does my bomb look big in this?" and her eating partner in crime. 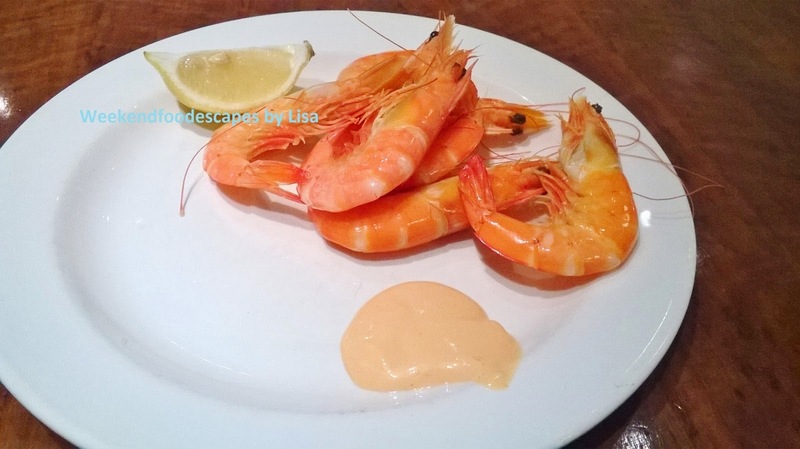 Prawns! Are you ready to peel them? 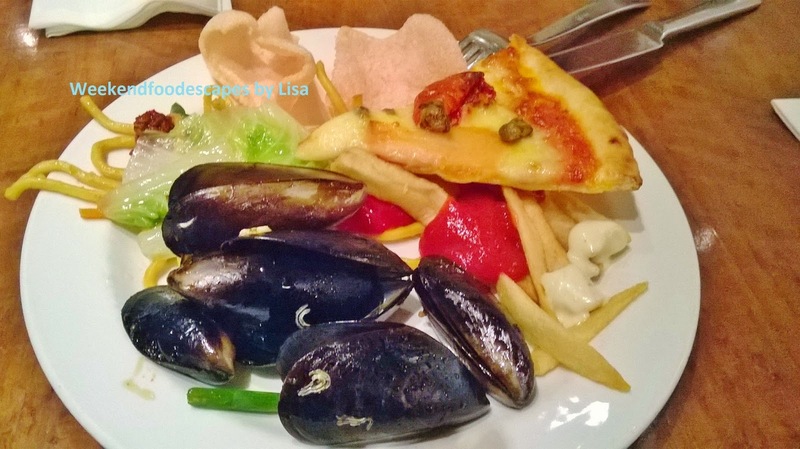 The Star Garden Buffet is great for tourists or perhaps a one time a year visit for Sydney locals. You often see bus loads of Asian tourists making a stop at the Star Garden Buffet. There is such a wide range of food. A lot of people come for the fresh prawns! Popular with the kids are an array of pizza, garlic breads and pastas. Chips and the chocolate fountain also seem to be very popular. The pizza bases are very thin and the choices have a good variety. Below was a thai curry option (rice is off to the side) and fish fillets. 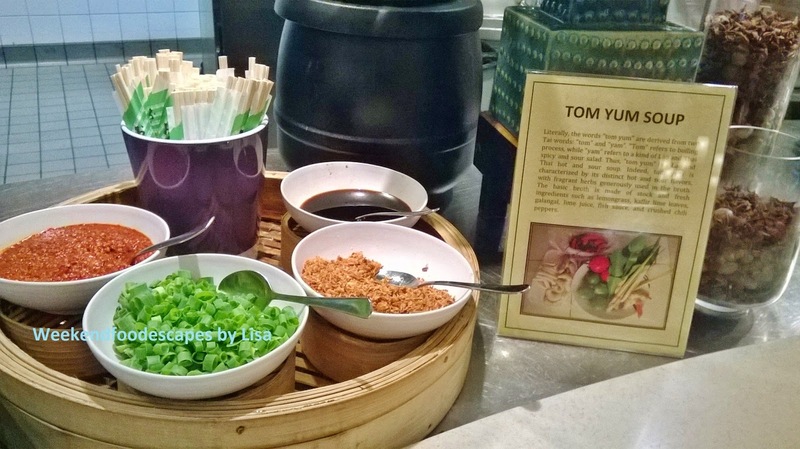 You can also make your own Tom Yum Soup and top with your own toppings. It was a good mesh of Asian fusion type dishes. 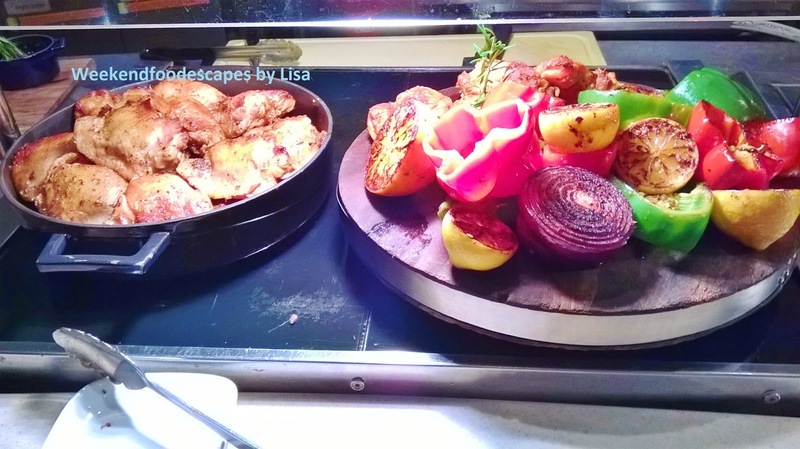 For a more modern Australian feel, you may opt for the roast type dishes which had options of chicken, carvery type meats such as beef and don't forget your roast vegetables. My favourite in dessert is ice cream from the machine topped with chocolate sauce, followed by some sneaky pieces of fruit dipped in the chocolate fountain. 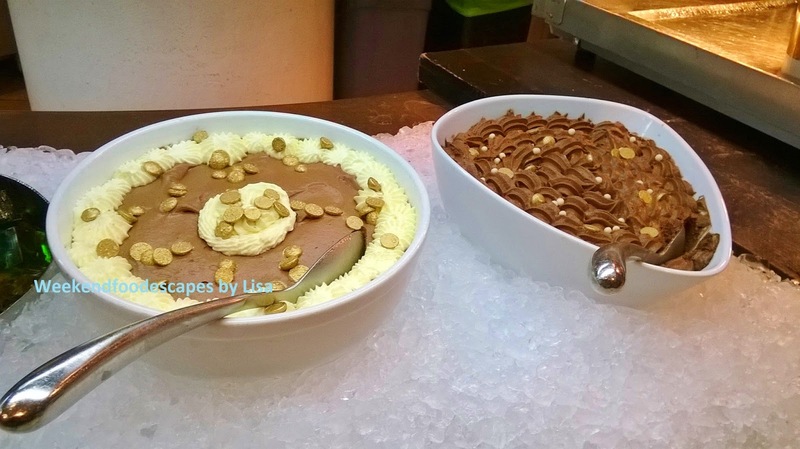 For fans of cakes and chocolate mousse, you will have some options too. All the food is cooked well and considering this is mass production of food, I quite like the Star Garden Buffet. 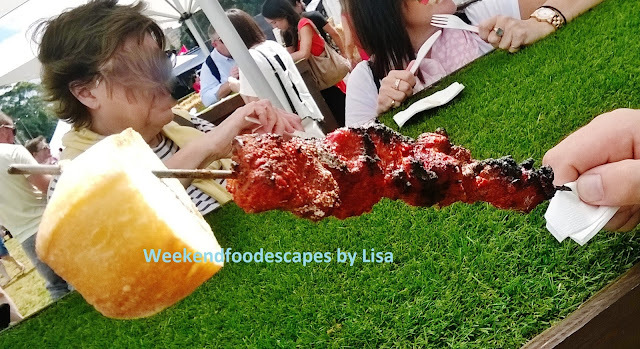 I'd only say it's a once a year visit though because of the great competition in Sydney when it comes to food!! Don't wear thongs (Flip Flops) or you won't be able to enter the Star. Location: 80 Pyrmont St, Pyrmont. 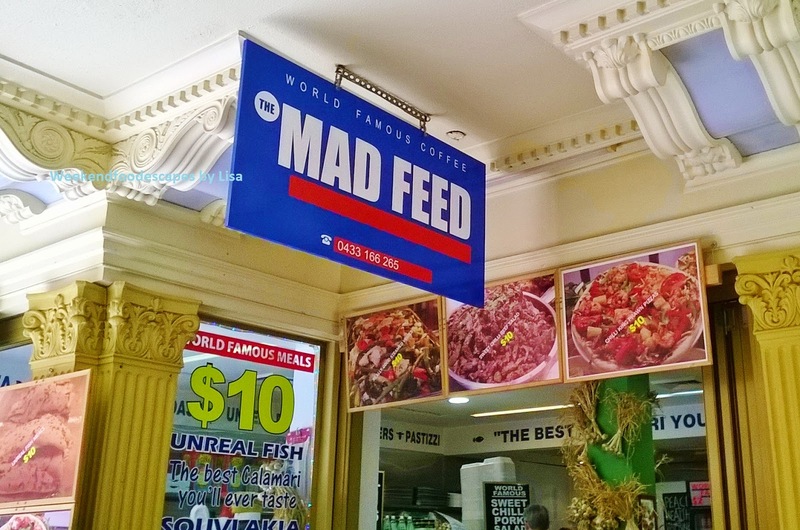 The Mad Feed is incredibly popular for lunch in North Sydney. 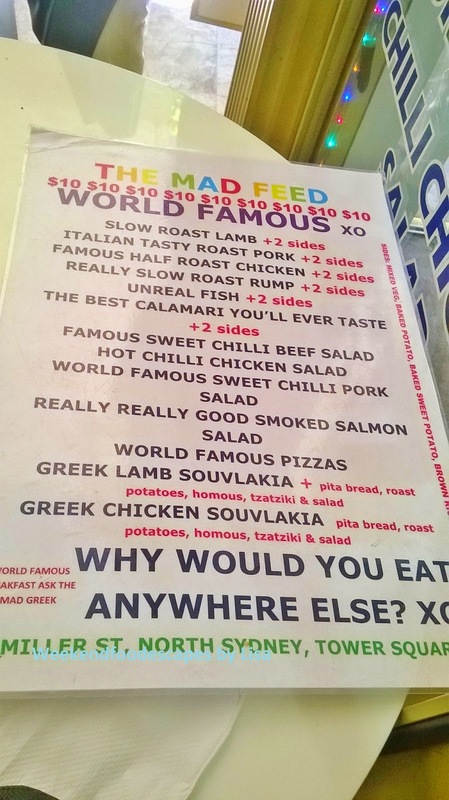 Also known as the Mad Greek, it has an extensive menu (below) of all sorts of meals, all for $10. The like rate of 86% on Urbanspoon is well deserved. I would only suggest you get there a touch before noon to avoid a long queue of hungry North Sydney workers. All the food is mass produced and then is collated on plates as the long queue progresses. The game of Mad Feed is generous portions, prepared quickly and getting as many customers through as possible. 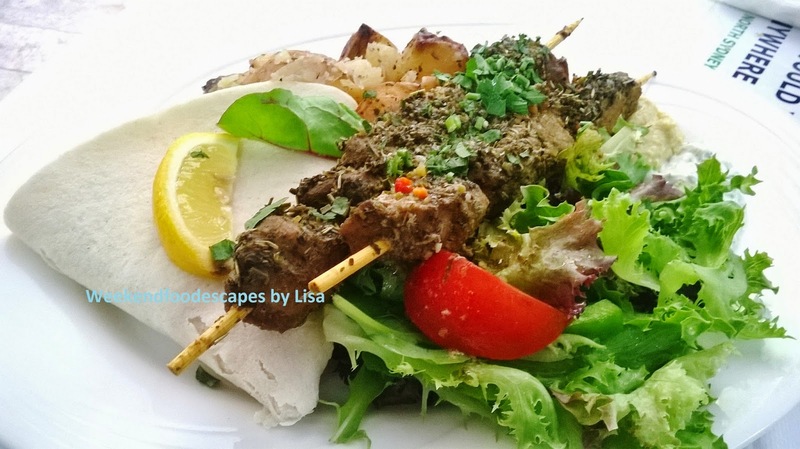 The lamb souvaki (above, $10) comes with two lamb skewers, salad, potato and soft tortilla-like bread. It's delicious and a perfect meal to share for two women with average appetites. The meat has been well cooked but can sometimes be a bit dry. For a slightly lighter meal, you may opt for the Calamari ($10) with your choice of two sides. I choose potatoes and salad. This is all complemented with a side of aioli. I've also tried the chicken souvaki (above). I prefer the lamb but variety is the spice of life. I find that chicken tends to try be more dry than lamb. 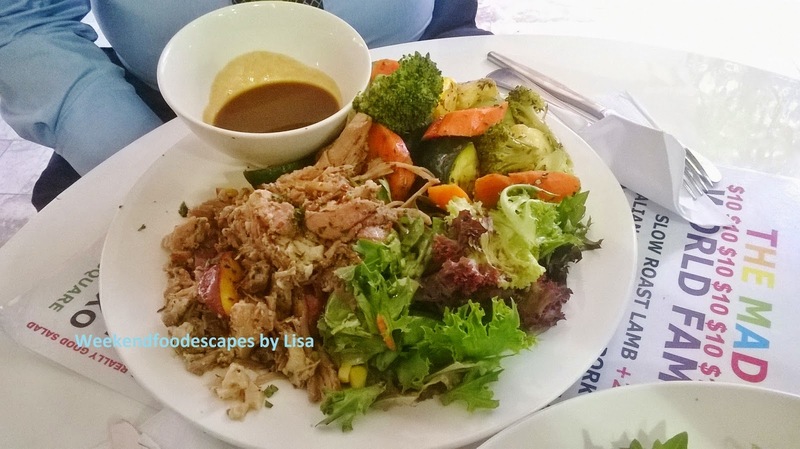 The roast pork is very homely with gravy and a side of salad and vegetables (above). The chili beef is a generous serve of beef on a bed of salad below and my work colleague often asks for a tortilla bread (additional $1) to carb up the meal. A cheap and cheerful place for lunch. Get in early!! Location: in the forum, 155 Miller St. Entrance is also available via stairs across from Berry Square Office Works. 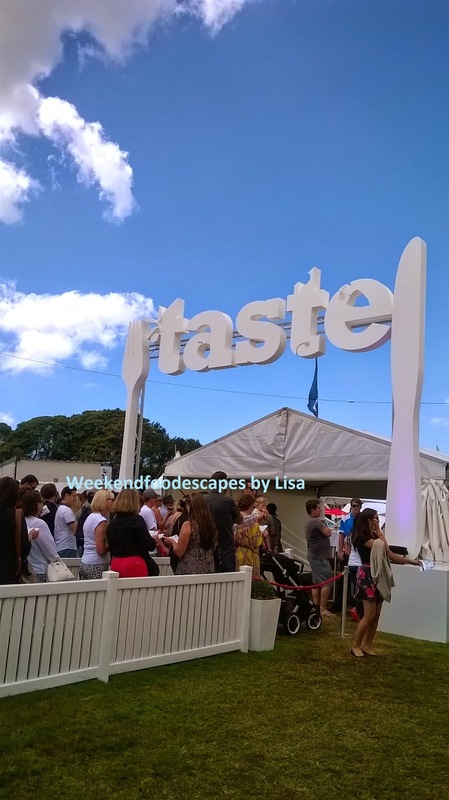 The Taste of Sydney 2015 took place over 12th to 15th March. 24,000 people attended the event which took place in Centennial park checking out the pop up bars, food, master classes, demonstrations and live music. 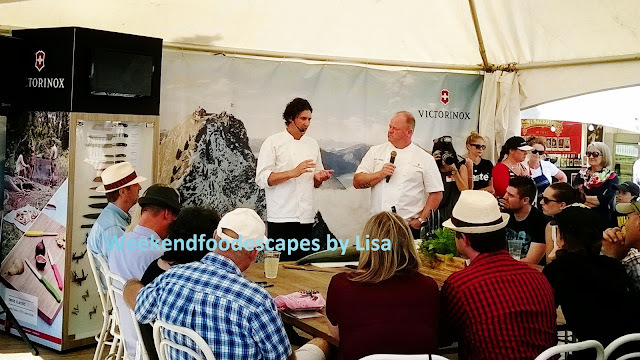 Many of the headliners were the very popular including Sake, Otto Ristorante, 4fourteen, Porteno, Jonahs just to name a few. It's an opportunity to sample finer foods but come ready with money to spend on tokens because you could easily walk away spending $100 or more plus entry which is about $30. Get public transport as parking is a bit tough. From the Urban Purveyor Group, the Wagyu Beef Gyoza $8 for 3 Gyozas and the Texas Styled Smoked Pork Belly for $10. 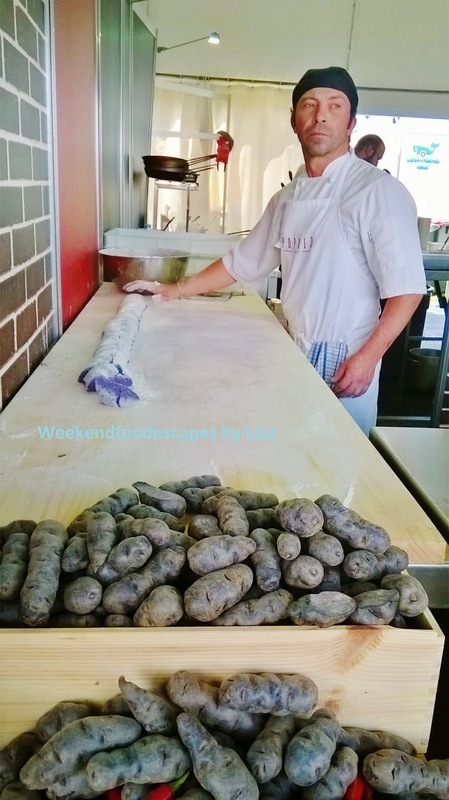 Chef preparing the Purple Potato Gnocchi from Popolo with mixed mushrooms, chili, pinenuts and salted dried ricotta at $12 (Chef above, gnocchi below). 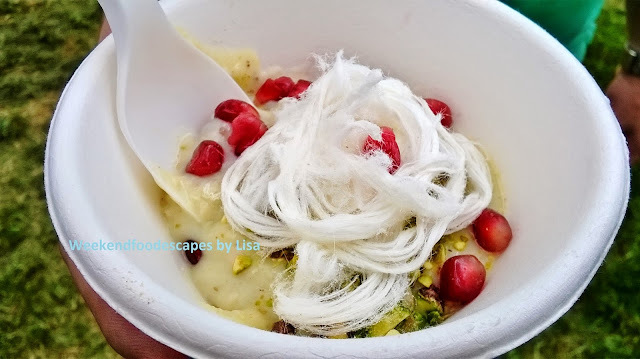 Keskul - pistachio and almond pudding pomegranate and vanilla pashmak from Efendy. 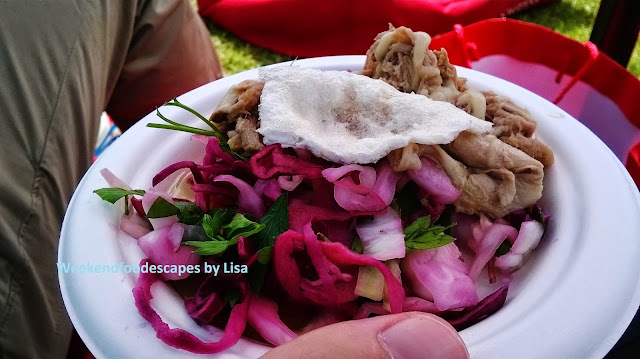 Delicious pork with red cabbage below. What a day! All the dishes were delicious and very enjoyable to eat. I could easily go broke going to this festival. Note: I obtained complimentary entry. All food was purchased and photos, opinions are my own.